Many accounts of Operation Bluestar, including the SGPC's White Paper on the Punjab Problem, relate that the Red Cross was refused permission to enter the Temple complex and the wounded were left to suffer for days. Many people died of dehydration as they were refused water. Bhan Singh told the members of the Citizens For Democracy team: "They [the Army] treated the inmates of the complex as enemies and whenever there was any person wounded on account of the firing, no Red Cross people were allowed to enter, rather the Red Cross personnel had been detained beyond Jallianwalla Bagh" more than a kilometre away from the main entrance to the Golden Temple from the Chowk Ghanta Ghar side. The CFD report, 'Oppression in Punjab' remarks: In accordance with the UN Charter of Human Rights, the Red Cross is permitted to go in aid of the wounded right inside the enemy territory, but in Amritsar in June, 1984, the Red Cross was not allowed to enter the Golden Temple - a respected and hallowed part of our country - in aid of Indians under attack from the Indian Army. It only means that the attack was so brutal and the battle scene so grisly, that there was much to hide from public scrutiny, even if it be that of a neutral agency called the Red Cross. This also explains perhaps why Press censorship had already been imposed, the last of the journalists were hounded away and the Press was not allowed to go inside the Golden Temple up to June 10, when they were taken on a guided tour of the complex for the first time since the Army operation began almost a week before. "On Saturday, medical workers in Amritsar said soldiers had threatened to shoot them if they gave food or water to Sikh pilgrims wounded in the attack and lying in the hospital"
The Indian Government maintains that the attack on the Golden Temple (Sri Darbar Sahib) was launched in order to remove terrorists from the complex. In addition to the various facts covered in the previous write ups, including the lack of arrest warrant etc, which contradict this, is the fact that up to 75,000 Indian Army troops were deployed in Punjab. This figure is mind boggling, why would the Indian Army require tens of thousands of troops to arrest or kill 2-300 Sikhs? "Some of our innocent countrymen were administered an oath in the name of religion to support extremists and actively participated in the act of terrorism. These people wear a miniature kirpan round their neck and are called "Amritdharis". They have to be subdued to achieve the final aim of restoring peace in the country. Any knowledge of the "Amritdharis" who are dangerous people and pledged to commit murder, arson and acts of terrorism should be immediately brought to the notice of the authorities. These people may appear harmless from outside but they are basically committed to terrorism." This excerpt from the official document exposes that in fact all practicing Sikhs were considered terrorists and were targeted by the government. "The army and police have also taken over 38 temples and other Sikh religious buildings throughout Punjab". 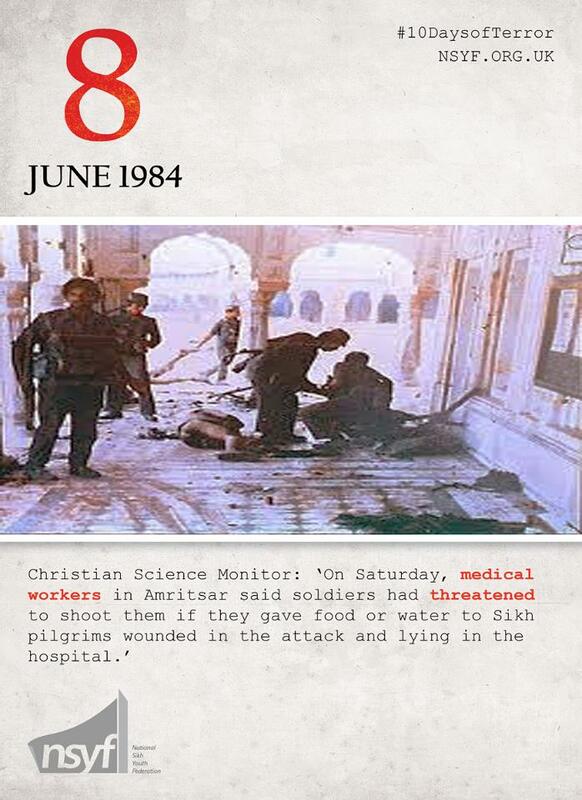 "According to reports from Patiala Hospital, over 50 people were killed at Gurdwara Dukh Niwaran. Amritsar: Mrs. Gandhi's Last Battle , Tully, Mark and Jacob, (New Delhi,1985). "These were the other victims of Operation Bluestar, little children, some only two years old, who got rounded up. Since then, 39 children have been languishing in two Ludhiana jails. The youngest of these children, Jasbir Kaur, is only two years old, her sister Charanjit Kaur is four, and her brothers, Harinder and Balwinder, are six and twelve. There is four-year old Rinku whose father died during the army operation and whose mother has been missing since. Like the rest of the 'infant terrorists', Rinku had to go through gruelling interrogation. When asked where his mother was he replied, "I don't know". Asked where his father was, he said, "Killed with a gun". Why his stomach was so big; "Because I eat clay". Their ordeal began in early June when they were picked up around the Temple and packed into camps in Amritsar and Jalandhar. Two central agencies, the Central Bureau of lnvestigation (CBI) and the Intelligence Bureau (IB) began their questioning. There were long, intimidating sessions. The children cried and begged to be sent home. But it went on for days. Their little finger prints were taken and IB sleuths set about verifying their bonafides. One interrogating officer admitted that officials were not moved by the children's cries. Sadly enough, in their interrogations, the CBI and IB have shown little regard to any civil liberties or laws protecting young children. "These are all fine ideas for newspapers and preachers.We had on our hands suspected terrorists and would be terrorists" confessed a CBI officer.Their fate depends upon the Supreme Court, which takes up the case this fortnight. Meanwhile 39 little beings continue to pray for freedom every day. Mehrban Singh, aged twelve, said, 'We were repeatedly asked if we were Bhindranwale's men. They hit us at Ludhiana jail, and thrust fingers into our necks, wanting us to confess." Shamsher Singh, aged eleven, confirmed the bizarre interrogation about Jarnail Singh Bhindranwale, and that they were "regularly beaten in jail"